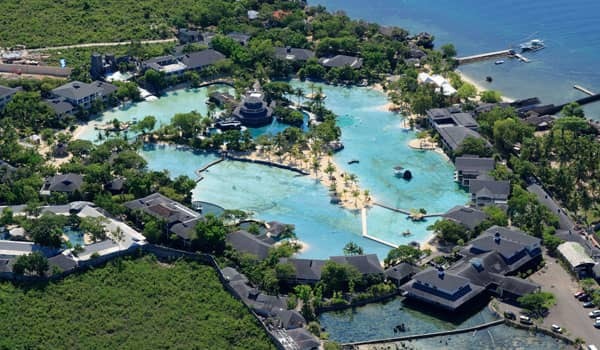 Whenever people ask us what is the most unique hotel in the Philippines, our answer is always Plantation Bay in Mactan. 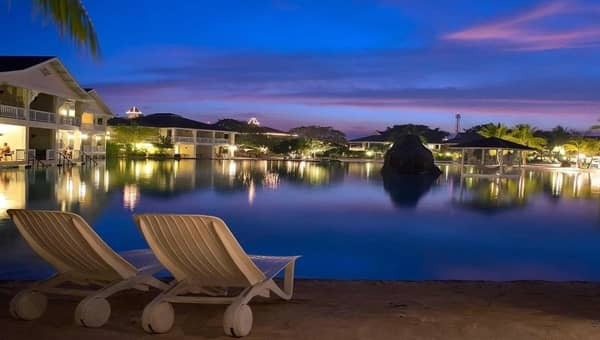 This 5 star resort might not be the best or most luxurious one, although it doesn’t fall short in that regard either, but it’s definitely the most special one. 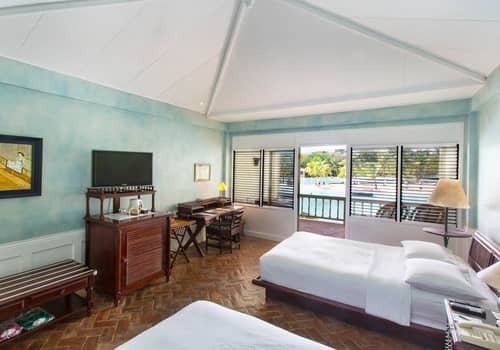 With a large artificial lagoon at the middle of the property, which is designed entirely in a colonial-plantation style, you really get a feeling like you stepped back in time and reached some remote village in paradise island. For us however, what truly sets them apart is their management. We have never seen a hotel being so honest and upfront about everything it offers – they make sure guests know both the good and the bad sides of staying there in advance. Not only that, but they are the only resort in the world who offers an automatic full refund even once you get to the hotel – no questions asked! They are so confident you will love it, and they are unapologetic about the service they provide. To us, this is a true evidence to the resort’s quality, as well as the type of service you can expect to enjoy there. 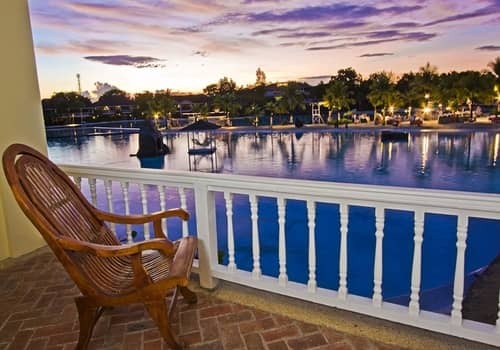 The Plantation Bay resort should be mainly compared with the Shangri-La Mactan. 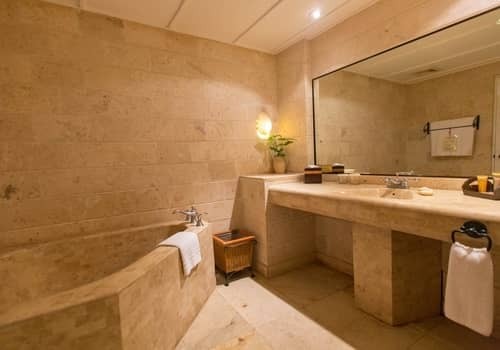 While there are many other 5 star accommodations on the island, these 2 are really miles ahead of the competition when it comes to luxury and comfort. So, this review will be written with that in mind, to help you understand the differences between both resorts and decide which one is better. To make it short, both of them are the best choices for people who seek a real all inclusive experience and are less worried with the price. 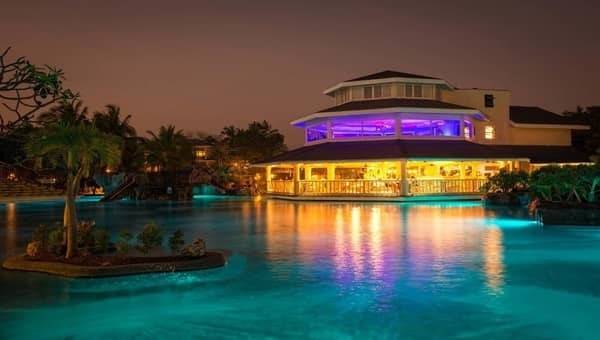 Everyone can visit the Plantation Bay resort in Mactan and enjoy it – singles, couples and families would all find a place there. Absolutely top notch service everywhere you go. Everyone is friendly and helpful, and are committed to providing a personal experience to help fulfill each of your desires. We already mentioned the management, who always have their guest's comfort and satisfaction in mind. The only issue we have is that the resort is very large, so sometimes you'll have to wait for a golf cart to come pick you up. 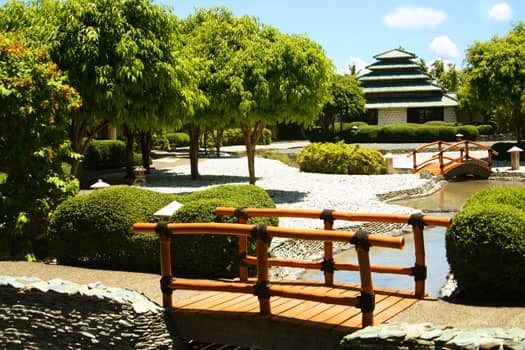 You would never believe this is actually one of Mactan's longest standing resorts. Everything looks brand new and the design of the place is simply breathtaking. Rooms are quite basic in their design, and the furniture is a bit worn out in some of them and could use a slight facelift. That said, they are still very comfortable and help create a feeling of luxury. 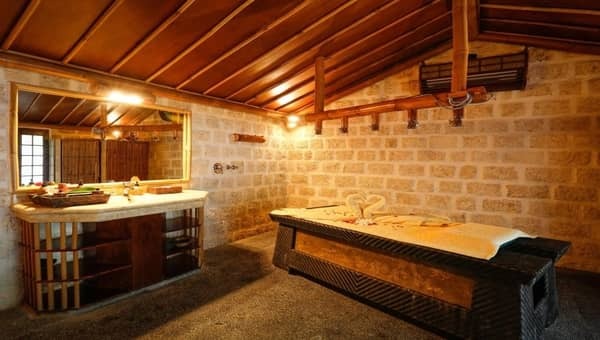 The bed is comfortable, and the shower is fantastic – both the space provided and the free toiletries which are all of the highest level. One thing worth mentioning is that standard rooms here are substantially larger than those at similar 5 star hotels. In our opinion this is the best setup in Mactan. The swimming pools aren't particularly large, but they are very well spread all across the property so you can easily reach them no matter where your room is. 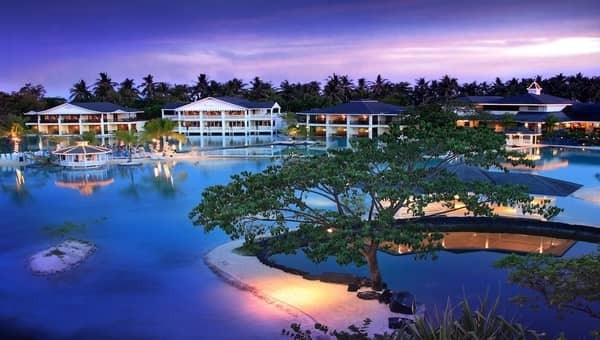 On top of that, there's a huge artificial lagoon which is the trademark of the resort. The beach are is also quite large and very well maintained – a great beach, at least by Mactan standards. Same as the other luxury resorts, they went for a more exclusive and private location instead of building it right at the center. This also makes sense as the Plantation Bay is the largest in Mactan in terms of land size. While the location is easy to reach, it is quite far from everything else. This is really a place you should visit if you don't plan on leaving the resort too much. 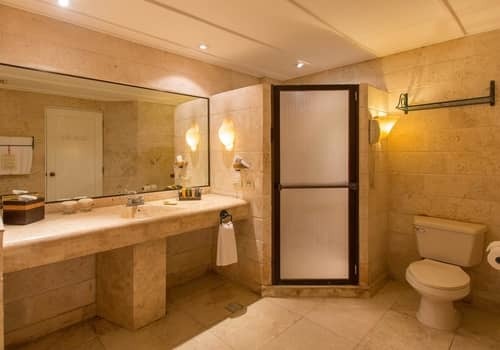 The plus side is that it provides the perfect setting for a quiet vacation for both honeymooners and families alike. Plantation Bay is by no means a cheap resort, but you get a lot more than what you paid for. 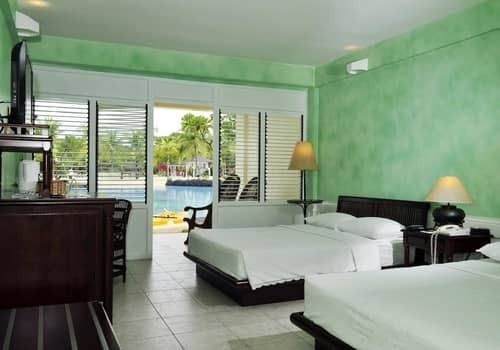 The level of quality and comfort provided by the resort's all inclusive nature is really outstanding, and can only be compared to the very best hotels on the island. 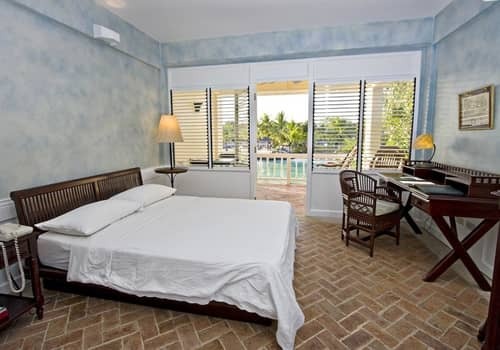 With that in mind, Plantation Bay actually offers extremely competitive rates for its rooms and everything else. Due to its remote location, we didn’t even know the resort exists at first. However, we quickly learnt about it as practically everyone we met has asked us if we paid them a visit already. The Plantation Bay is widely considered as the best hotel in Mactan, and it was recommended to us even by competing hotels. So, we decided to stay at the resort and came with the highest expectations possible – planning on having a true luxury getaway in a tropical paradise. Upon reaching the resort, it didn’t take longer than a minute to realize the praise was justified. The reception area is beautifully designed and we were greeted with a warm smile and refreshing drink. The check in process was quick and efficient, and we were even offered a quick tour of the estate so we can make sure we are getting what we expected. 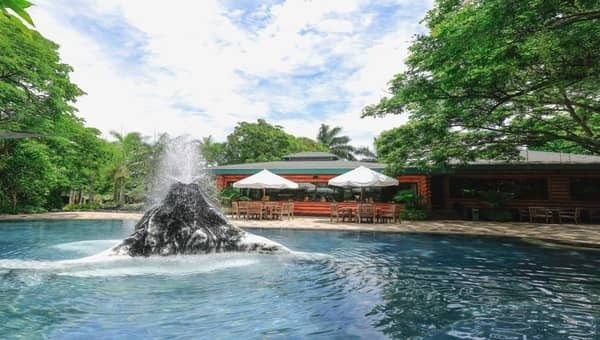 The resort sprawls across 11 hectares of land, making it the largest in Mactan – but still you feel like your’e staying at a comfortable small village. 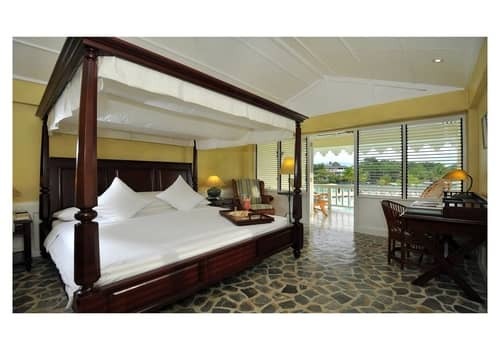 There are only 255 rooms at Plantation Bay, which is really a small number considering its size. Just for reference, the Shangri-La has more than the double that even though it’s significantly smaller. The Crimson resort, another 5 star luxury hotel, has more rooms as well while occupying less than half of the land space Plantation Bay does. No wonder that when we reviewed both of those hotels, we specifically mentioned they feel a bit overcrowded and service is sometimes slow. This is definitely not the case here, where you get to enjoy a lot more privacy and personal attention from staff members. 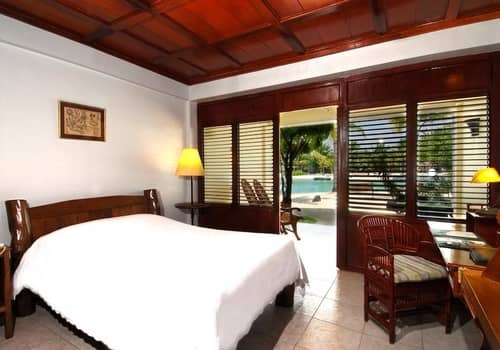 Rooms are all very spacious, and don’t fall short when compared with other luxury resorts. They are much bigger, and very well furnished. 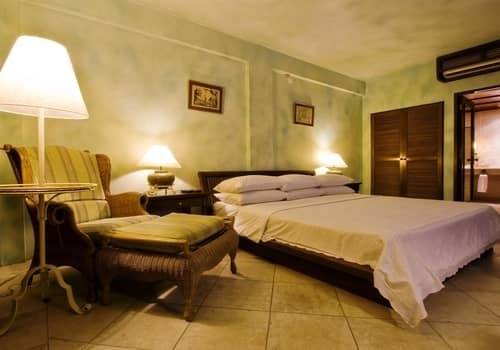 The only place where you can find substantially larger rooms, which are also more luxurious is the Abaca boutique hotel. Abaca is a tiny place with only 9 rooms, providing a tailor made luxury experience of the highest standards, but of course it’s also reflected in the prices they charge. Plantation Bay’s value over Abaca comes from its wealth of available activities and services, and its all inclusive nature. Even the smallest rooms are large enough to accommodate 2 adults and 2 children. 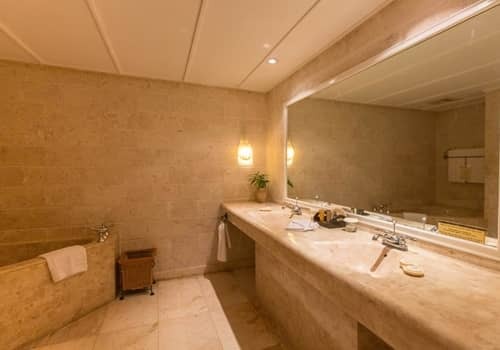 They come with a nice private balcony, a working station and a separate shower area. 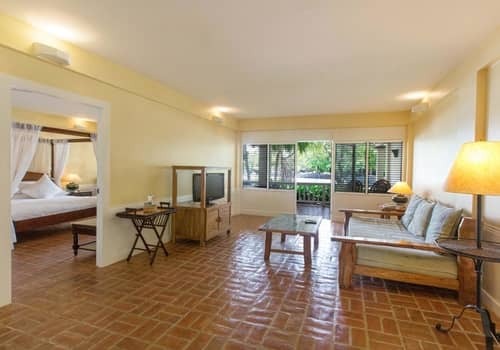 All rooms are equipped with AC, a large LED TV, free wifi, safety deposit box and a mini bar. 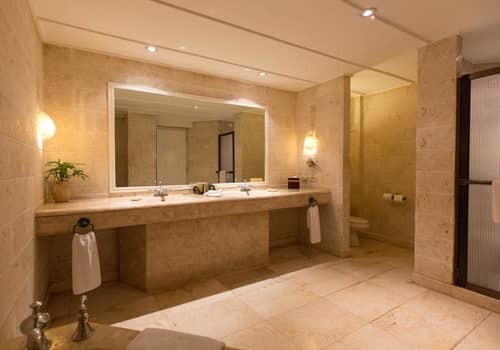 Toiletries and other small amenities are provided, as expected by any self respecting 5 star resort. The room’s rate doesn’t include breakfast – you can choose each morning if you’d like to have it or not, and charge it to your room. We feel this is actually quite fair, especially since the breakfast is very reasonably priced – roughly 10$ per person. 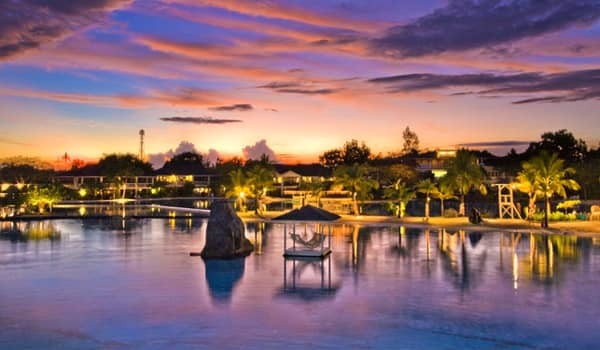 Do Guests Like The Plantation Bay? With over 20 years of experience, Plantation Bay has managed to maintain a very good reputation, which is no small feat. This proves the level of consistency provided there, and meas you can be certain your expectations will be met. As with every long standing hotel though, there are some issues which must mentioned, and it's also only natural they collect some bad reviews over the years. From going over the information available online, we feel there are a few things that could affect the resort's rating. Even though they do a very good job of being transparent, it's important you take some time and understand if you are one of the people who would enjoy this place. Thanks to its longstanding reputation, many of the guests here are locals. For them, paying 200$ a night is a small fortune, which makes their expectations go through the roof. The first place we checked was Tripadvisor, where Plantation Bay has a rating of 4.5 and is the 3rd best hotel in Mactan, right behind Abaca and Shangri-La. There are no less than 1867 different reviews, with only 7% of guests rating their stay as below average. Foriegn guests really liked the lagoon, the peaceful romantic ambiance and the all inclusive service provided by the resort. Complaints were quite rare, but mostly revolved around the rooms being old and outdated, and the location too remote. 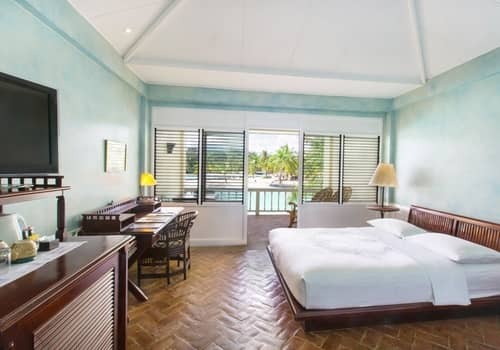 There are also 605 reviews on Booking.com and 1289 on Agoda, where Plantation Bay enjoys an average rating of 8.5 and 8.2 respectively. Again, this makes the resort one of the highest ranked 5 star hotels in Mactan, with better ratings than those of Crimson or the Mövenpick for example. People seemed to really like the services, the lagoon and pools, and the amount of available activities. Complaints were mostly regarding the price and the state of the rooms, with the food offered at the resort also getting mixed reviews. There are 5 different restaurants at the resort, each offering a different style of cuisine. These include an international kitchen, Asian seafood, a tapas and pastas bar, fast food style with a 5 star twist and a ice cream and cocktails bar. As mentioned, breakfast isn’t included in the price of the room, and you choose to have it at any one of the restaurants or even at your room. We have to be honest and say the food here gets mixed reviewed by guests. The management is also aware of that, and they are willing to replace any dish for free if you don’t like it. A special themed buffet is organized every Monday, Wednesday and Friday starting at 6:30pm. It includes a rich selection of dishes and a live show, both inspired by some specific area or culture in the world. On top of that, there are always other entertainment and shows organized by the resort, but these aren’t done on a regular basis. So, if you are interested in those it’s better to simply ask about the schedule at front desk. 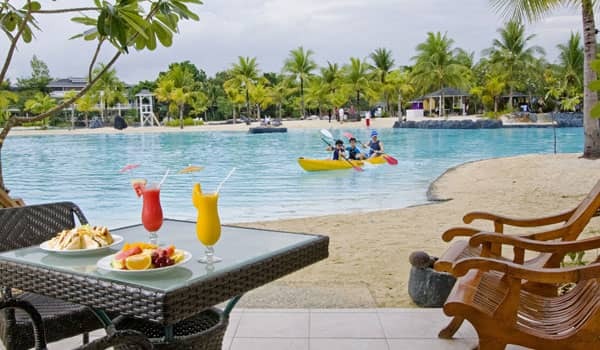 Plantation Bay also offers a plethora of additional services and activities, many of which are without any additional charge. 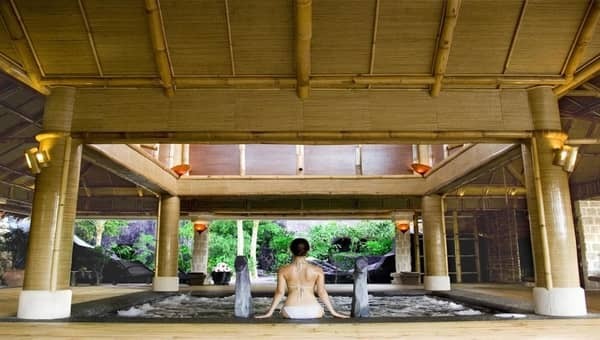 The spa in particular is excellent, but treatments are not cheap. The gym is relatively small, but is well maintained and has all the necessary equipment. There’s also a very nice game and entertainment center, as well as a shooting range which is free to use. Other free, exciting activities include snorkeling, wall climbing, archery, bird watching, mini golf and beach sports such as volleyball. There are also plenty of free activities especially for children which are organized and supervised by well trained staff members. These include fishing lessons, boat racing, arts and crafts and many other exciting activities. The resort however, does not provide nanny or babysitting services, so you’ll have to stay with your kids the whole time. Paid activities are mostly related to the water. The resort has its own dive shop, with a huge selection of available dives – for both beginners and experts. They’ll take you on a boat to the Hilutungan marine sanctuary, one of the best coral reef sites in Cebu. The prices however, are not as cheap as in other dive shops so please keep that in mind. Other water activities they charge for include jet-skis, banana boat and parasailing. On top of that, you can also rent the tennis court for 4$ an hour, or go play golf at a nearby golf course for 60$ per person. Overall, we feel like Plantation Bay does exactly what it was meant to do – provide a real one of a kind experience of luxury and comfort. While the location might be too remote, and the rooms could use a slight facelift, the overall value provided here is outstanding. The resort definitely stands in the same line as the most luxurious hotels in Mactan, providing a complete all inclusive stay. 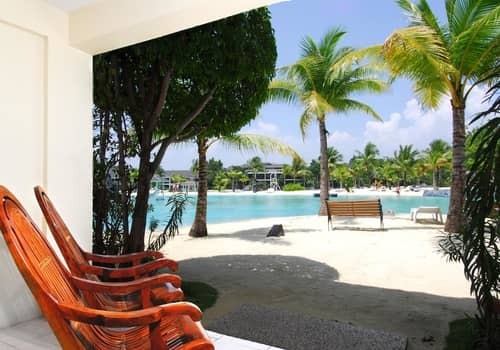 We especially recommend Plantation Bay for couples and small families, who seek a private and quiet vacation in a luxury paradise. 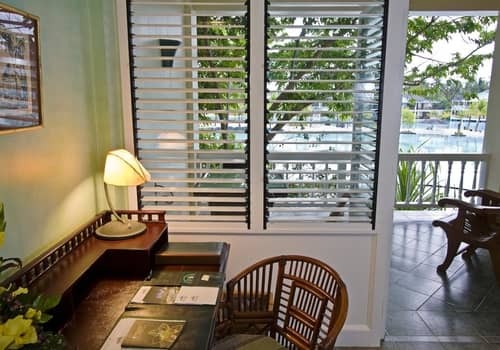 These rooms are 46m2, and a private balcony overlooking the lagoon. They each come with your choice of either a king size bed or 2 queen sized ones. An additional Futon bed can be added for a small fee. For an extra 20$ a night you can get a room right next to the Lagoon. The room is exactly the same as the Lagoon View version, only with slightly newer furniture. 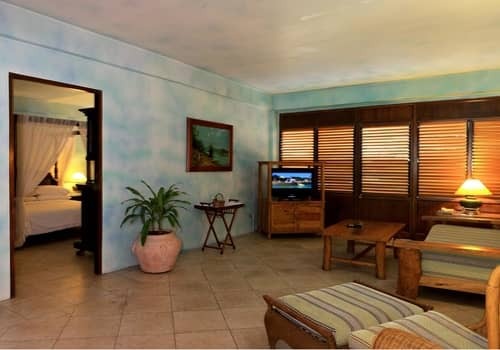 The 1 bedroom suite is a perfect choice for honeymooners and small families. it has a living room and a large private balcony that goes directly into the beach. With 92m2 it can comfortably it in up to 4 people – there are either a king size or 2 queen size beds, as well as a sofa bed in the living area. The 2 bedroom suite is exactly the same, only with an extra bedroom. Recommend capacity is 6 persons, but up to 8 can stay there quite comfortably.